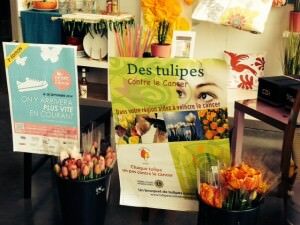 Again this year, the Lions Club has chosen Imagine for Margo as partner, enlisting us in their national project “Tulips against Cancer”. The project takes place at the Zodio store in Chambourcy (78). Thank you all volunteers that have relayed in the collection and sale of tulips over the whole weekend, as well as to the purchasers. All the funds will be donated to the podiatry service of the Institut Gustave Roussy.